How many times have you encountered an article telling you that guest posting is worthless? 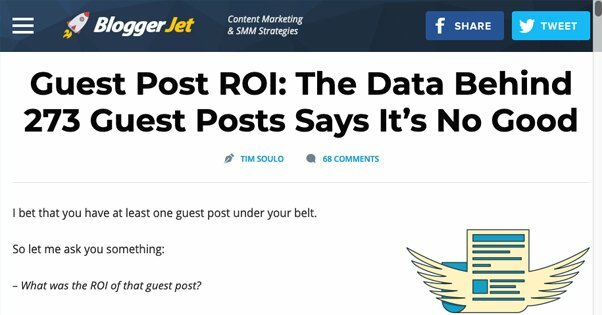 Time and again, I encounter posts like this one, talking about the low or nonexistent return on investment for the typical guest post. Most such studies focus on a lot of intangible metrics. They talk about the referral traffic you get from a guest post. They talk about the backlinks, and try to assign some value to an individual link. They talk about the benefits of exposure and reputation, the fact that you get your name and profile picture shared around the web. They talk about the chance to start up a relationship with some editor who can get you another post later, or maybe be a reference when you need one elsewhere. Some of them even talk exclusively about the monetary reward and decry anyone who writes for free. All of these are benefits to guest posting, and sure, you can assign values to them and calculate your ROI out of them. There are plenty of posts out there that help you figure out how to do it. Here’s the thing: none of those metrics are a good ROI. Referral traffic is extremely short-lived, and it’s often just a fraction of the traffic the guest post gets. It’s hard to convert that traffic into anything tangible. Backlinks are nearly impossible to quantify since metrics like PageRank have been removed, and paying for tools to monitor modern link metrics is just another cost. Exposure and reputation are far too intangible to actually quantify. Unless someone comes up to you and says “hey, I saw you on X.com, want some work?” you’re not going to know. Starting up a relationship with an editor can have wildly different levels of impact, and there are ways to network with influential people without needing to go through the guest posting process. The monetary reward is tangible, IF you’re writing for a site that pays you, though those can be few and far between. Mostly, though, they won’t pay much compared to what your time is worth. In my view, while all of these can be beneficial for a guest post, the real value of a guest post is in the long-term benefit to your SEO. Now, this is where things get a little tricky. 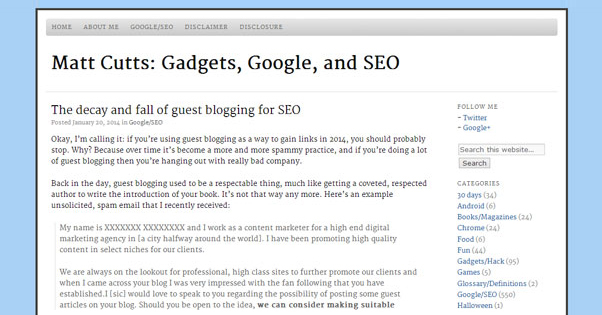 Remember that famous post from Matt Cutts about how guest posting is dead? We all know it didn’t die, but what most people have taken this to mean is that guest posting for SEO is dead. Indeed, low-quality guest posting as a technique is no longer viable. You can’t just scattershot out your pitch to a hundred sites, write low-tier articles for them, get a pile of links in return, and profit. Like many spam techniques, though, there’s a kernel of truth to it. You can do exactly that, if you kick it up a notch or three on the quality scale. What’s the difference between a black hat guest post and a white hat guest post? Quality and focus. What do you need to do, if you want to get SEO value out of a guest post? You need to be selective with your choice in sites. You need to pick high value topics that fit the site. You need to make a unique pitch. You need to insert a high-value link. You need to get value from that link. This isn’t as hard as it seems. Here’s my process. The first step is to find valid targets. When you’re a small or mid-sized business, you probably have to a little legwork to work your way up. You’re not going to get a post published on Forbes right away. You might have trouble with sites like Inc, Entrepreneur, or the Huffington Post. You’ll have an easier time of it with industry-relevant sites. In my case, this tends to be sites like Search Engine Journal, for example. Sites that are potent in their niche, but are generally not considered global news sources or massive publications. I like to use something I internally call the ladder method. I start by taking a huge list of sites that I’d like to write for, ranging from small blogs to the big names. I categorize them into four steps. At the bottom, you have the fallbacks. These are sites that are low-tier, probably won’t get me much in the way of traffic or reputation, but aren’t spam sites. They’re more likely to give a followed link – more on that later – but they mostly serve as references that I’m more than just my own site. The backlink profile is useful as well; everyone needs an organic backlink profile, and that means you sometimes need links from sites you wouldn’t otherwise care about. One step up, you have the mid-range niche sites. 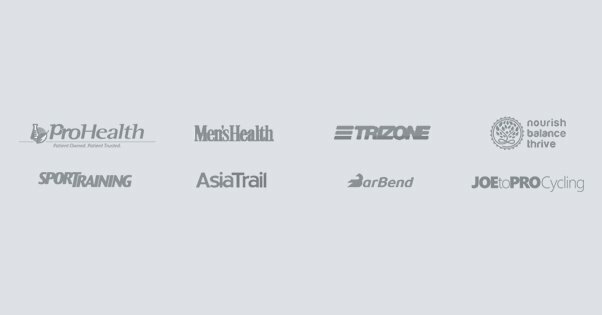 These are sites that are recognizable names in your industry, though they might not be the biggest names out there. Think Search Engine Land or Search Engine Watch, sites that have some authority but aren’t industry leaders. These are a bit less likely to accept a post, and a bit less likely to include a followed link, but they’re still relatively easy to get into if you have a solid pitch. A step up from there are the top-end sites in your industry. To continue with the marketing and SEO niche, these would be the Moz and the Hubspot style sites. 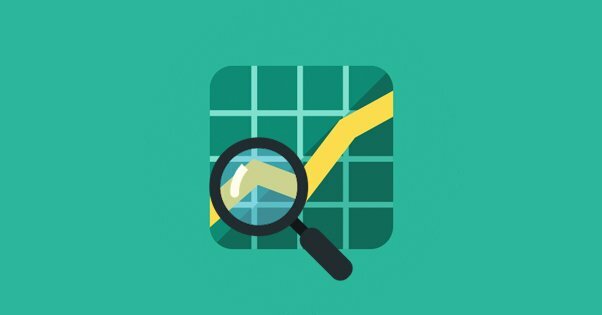 They’re highly influential and very potent for both SEO and reputation. They’re also generally fairly hard to get into, though some of them may have contributor programs like Moz used to have. The top tier, then, are the major global publications. Sites like HuffPo, Forbes, VentureBeat, Gizmodo, The Washington Post, and so on. The household names, the sites where a mention can legitimately result in a business deal, a book contract, or a life-changing angel investor. These are sites where you generally need a few good links to a few good posts on the tier below to be accepted. Work your way up the ladder. Pitch the highest tier site you can find, and if it doesn’t work, take a step down the ladder and try again. Find the level where you’re accepted as you are, and work your way up a few posts at a time. 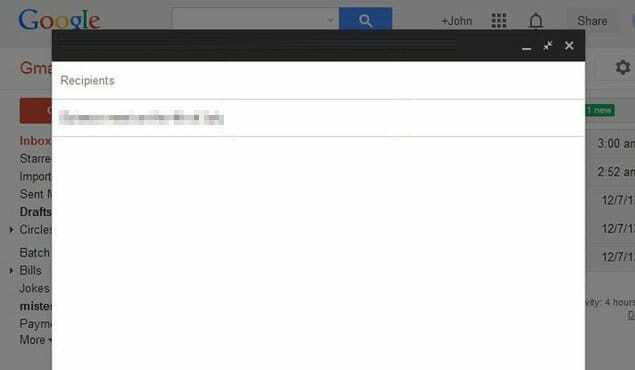 Much has been written about the perfect email pitch. I’ve covered it myself. To me, though, the number one most important thing about a pitch is that it’s pitching a subject tailor-made to fit with the audience of the site you’re pitching. Different sites have different preferences. Some want something that riffs off the news, showing that you’re on the pulse of your industry and have valid, important thoughts to bring to the subject. Some of them want something covering a strange niche or an off-the-wall topic they don’t usually cover. Some want something in the middle of the two, a spin on a topic they know quite well. Of course, you have to write a good pitch email, and make sure you’re paying attention to the pitch process for the site you’re targeting, if there is one. Don’t send a pre-written article to an editor who only wants pitches, and don’t send a pitch to a site that wants to review full articles. Not following directions is one of the fastest ways to be rejected. Writing a great article is of supreme importance when you’re guest posting, because this is flagship content that points back to you as part of your online reputation. This isn’t the place to go into all of what makes a guest post great, though. I’m sure you already know a lot of it. The key here is to write something that showcases your knowledge of the subject, and points back to your site for more information. The link is what we’re really after. A good link in a guest post does not lead to a landing page, nor does it lead to your homepage. A good guest post link leads back to another piece of content on your site that works as further reading on a subject. 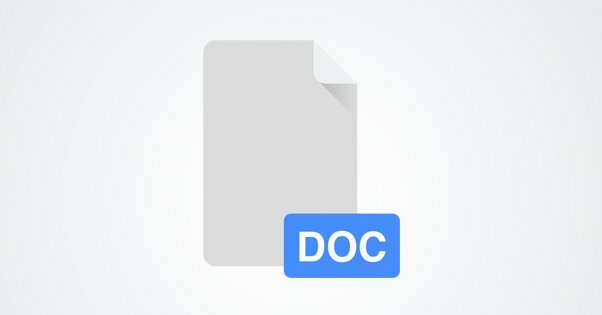 You see above, how I linked to a different post I wrote about writing pitches, and how that was a contextual link that allows you to spin off on one sub-subject, if you wanted to know more about it? That’s what we’re going for. You don’t need more than one link to your site, and you should always include multiple links to various blog posts for further reading. You don’t want your link to stand out as your link, you want it to be just another link for more information. I’ve mentioned NoFollow a couple of times, so what can you do about it? NoFollow ostensibly means that your links don’t have value, and it’s a tool many high profile sites use – and most sites use on guest posts – to avoid being targeted by people just looking to get their links in and bail. First, you need to make sure you include your links. Even if they’re not followed links, they still exist and still provide other avenues of value. More importantly though, you need to always make sure every link you share – in your guest posts, in your comments on posts on the site, in your social media comments, and anywhere else – leads to very valuable, relevant content. Your goal here is to take advantage of people remembering you in the future. When you guest post, the editor is going to read it, and other writers may as well. 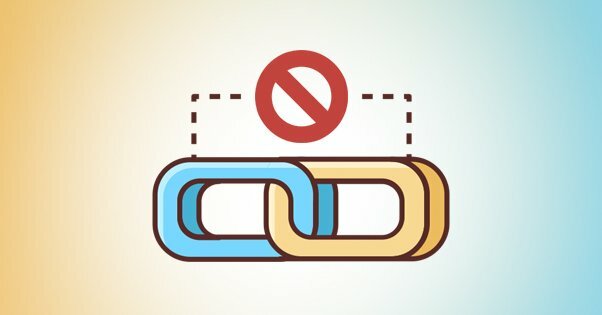 When you’re linking to your own content, they’ll probably check out those links, if for no other reason than to make sure they’re suitable for their publication. This puts you in their awareness, and they can look to you the next time they need a reference to something you’ve covered. Then when they link to you in their own writing later, those links are less likely to be nofollowed. You should also make an effort to mention your brand somewhere in the post, even if it’s in an unlinked mention in your profile for the site. Unlinked mentions are brand mentions, which are implied links. Google first patented the use of implied links when they rolled out a Panda update in 2014, and since then they have been slowly adding value to them in their algorithm. It’s not something you can tangibly measure right now, but implied mentions are likely going to be the future of SEO. Guest posting doesn’t have a tangible ROI unless you’re measuring the money you spend and the money you get back. It’s tricky to do, and it misses the best part of guest posting, which is the slow growth over time. The longer you keep up a campaign of guest posting, the more organic growth you’ll experience over time. Just guest post every few weeks and check out how much your site has improved by the end of the year. You might be surprised. Is MyBlogGuest Safe to Use After Being Penalized? 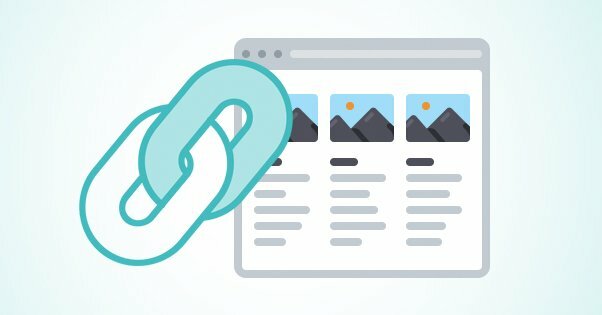 Are Guest Post Links from Medium.com Worth The Effort? Can You Include Affiliate Links in Your Guest Posts?